From the author of the Percy Jackson and the Olympians series comes another death-defying adventure about the Greek Gods and their heroic children. 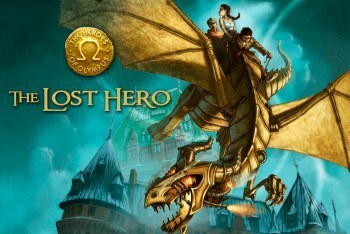 Check out The Lost Hero by Rick Riordan. Jason wakes up and he has no idea where he is, why he’s there, and more importantly who he is. His friends Piper and Leo seem to know him. In fact, Piper is his sort-of girlfriend. During a field trip to the Grand Canyon with a bunch of trouble-making teens, Jason gets the shock of his life. Monsters attack them, and it’s up to him, his friends and his coach (who turns out to be a satyr) to destroy them. He and his friends are rescued and taken back to Camp Half-Blood, a training camp for demigods (the children of the gods). There they hear a prophecy that forecasts a dangerous quest that will change their lives forever. Not only must they save Zeus’s wife, Hera, but they must also rescue Piper's celebrity father, who has been kidnapped by a merciless giant. Set one year after The Last Olympian (book 5 in the Percy Jackson series), The Lost Hero begins a new chapter at Camp Half-Blood. Unlike Percy Jackson, this series is told in third person, alternating between Jason, Piper and Leo’s perspectives in each chapter. The story had the same feel as the Percy Jackson books, but the third person point of view restricted Riordan’s humorous touches. The Lost Hero introduced Roman history, which was both interesting and at times confusing. Rick Riordan is perhaps one of the best YA authors out there. And even though The Lost Hero is a great book, it’s not quite as great as Percy Jackson.